I have just returned from a concert by Gabriel Meyer Halevy, an Argentine-Israeli musician. He is the son of Marshall Meyer, an American rabbi who lived in Argentina during that country’s “Dirty War” in which thousands of people became “desaparecidos” (the disappeared ones). Marshall Meyer’s work helped save the lives of dozens of people who were persecuted by the Argentine military. His son Gabriel carries his father’s same concern for peace and human rights. Gabriel, who lives in Israel, told the audience how, during the last Israeli offensive on Gaza, he joined with several Arab friends and, in the middle of the conflict surrounding them—like staying in the eye of a storm, he said—lived for several days in total community working and praying for peace. Their action was part of a growing movement called We Refuse to Be Enemies. The movement has the participation of Arabs, Israelis, and Israeli Arabs united in their longing for peace. 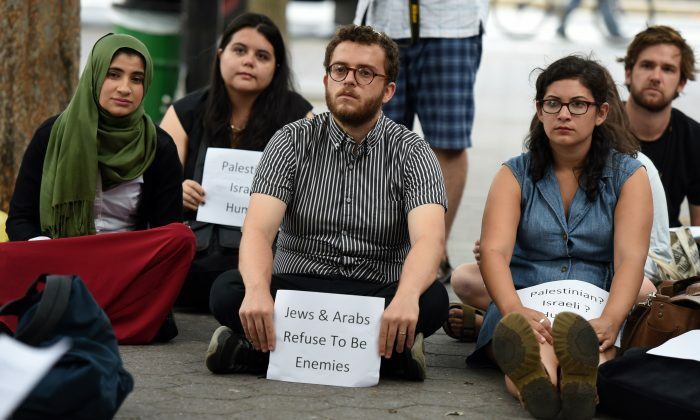 The “We Refuse to Be Enemies” slogan has now turned into an international social media campaign against the unnecessary deaths in the ongoing Israeli–Palestinian conflict and on the need for peace in the region. During the time Gabriel was with his Palestinian friends, living without any of the modern conveniences of the age—no Wi-Fi, no cellular phones, no computers—they only learned of the war raging around them through one of the members of the group. She lived nearby, and twice a day returned to her home to learn what was happening and conveyed the news to the rest of the group. Although a small movement at the moment, We Refuse to Be Enemies can become an important source of activities where both Palestinian and Israelis who want to know each other better join in a necessary step toward peace. In this regard, I remember an old Israeli professor who lives in Jerusalem who told me that, aside from his gardener, he had never spoken to a Palestinian person. How can there be peace among people who don’t know each other? Dr. César Chelala is a winner of an Overseas Press Club of America award and a national journalism award from Argentina.